Keeping cycling training interesting in the wintertime can be a real challenge in these frostier climates. 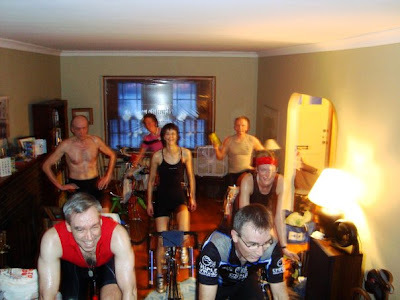 Enter the livingroom peleton, eight or nine cyclists on trainers in tight formation in front of a TV screen, couches and tables pushed to the walls to make room. Coach Troy barks out gearing and cadence in his irritatingly chipper way, while we spin and suffer and sweat in perfect unison. It’s tough for the folks at the back to see and hear the TV, so the ones at the front shout out the instructions “Big ring on the front, twelve on the back hard for a minute, 30 seconds off, five times!!!”. Groans from the back. The small fans scattered around the room can’t keep up and sweat drips off noses and from under arms onto towels placed under us to protect the wood floor. By the end of the workout the house is so humid that the windows and mirrors are all fogged up. We take turns showering and then gather around the diningroom table to enjoy a communal meal. Chili, spaghetti, stew, curry have been on the menu, good rib-sticking dinners that are heaven on earth after our hard efforts in the saddle. Dinner is accompanied by bread and butter, salads, dessert and plenty of beer and wine. The conversation meanders a natural path from movies to cycling to skiing to travel, and back to cycling. We talk about the pros, we talk about our kids, we make plans for the next time we are going to get together and sweat. For this group, there is no rest. We bike, ski, swim, run, curl, whatever. Anything but being still. After all, we always say, you can rest when you’re dead. Fantastic dedication to the sport! Seems to me though you'll need to plan a deck expansion for group rides before the spring classics?